An unusual rustic necklace of long tooth shaped, circular and square wooden beads. Perfect finishing touch for various charcaters i.e. Orcs...Suitable for most fanstasy or historical settings. A striking triple-stranded necklace of long wooden tooth-shaped pendants. Great for most settings. 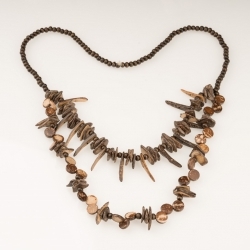 A statement necklace in brown, featuring tooth-shaped pendants and ring-shaped wooden beads.Suitable for a variety of settings. A statement necklace in grey/black, featuring leaf-shaped pendants and ring-shaped beads.Suitable for a variety of settings. A statement necklace in purple, featuring tooth-shaped pendants and ring-shaped wooden beads.Suitable for a variety of settings. 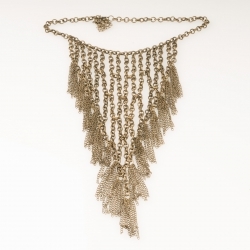 A statement necklace with a long mesh panel of silver, gunmetal and gold coloured chain. Great for most settings. A statement necklace with a cascade of gold and silver chains, suitable for most settings. Triangular Gemstones necklace set in a detailed metal cast, with a thick woven leather cord. Detailed diamond shaped cast metal necklace with oval Gemstones and a thick woven leather cord. This multi coloured crystal cut teardrop shaped gemstone necklace on a rolo chain is a superb for any fantasy character. A feather-shaped pendant on an adjustable necklace of beads and knotted red cord. A great talisman necklace. A leaf-shaped pendant on a braided Faux leather cord with clasp. A great addition to any earth-toned costume. For all your bottle opening needs! A statement necklace in cool colours, featuring gems, beading and floral tiles on a black cord with silver-coloured beads. This resin pendant, shaped like an abacus, is a good-luck charm for increase and success in business. 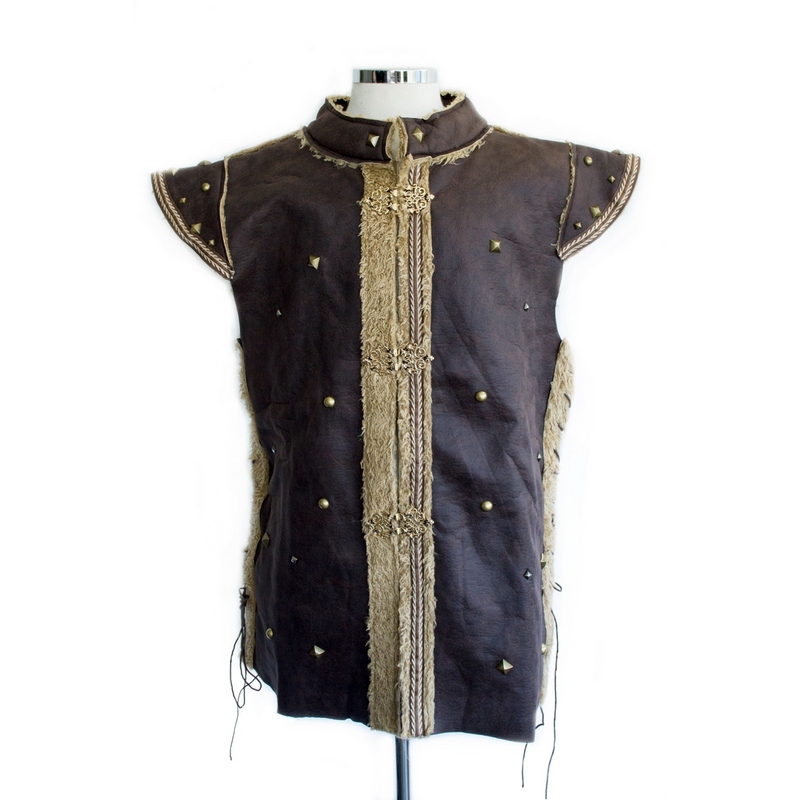 It is strung on a leather thong with cord and beads. Especially suitable for trader and banker characters. Wooden charm carved with coins shape, represent wealth and good luck. Wooden charm carved in gourd shape, represent wealth and good luck. Wooden charm carved with Chinese dragon. Wooden charm carved with walnet shape, represent Close and happy family also for good luck. Stone charm in gourd shape, represent wealth and good luck. Unusual, tactile talismans made of leather, resin and genuine seed pods with colourful wooden beads. Doubles as a handy rattle! A large faux blue agate cabochon in a silvertone setting on a silvertone ball chain. Opulent and great for noble, royal and rich characters. A very unusual necklace with a feathered drop and charm dangles, strung on a cord and chain.